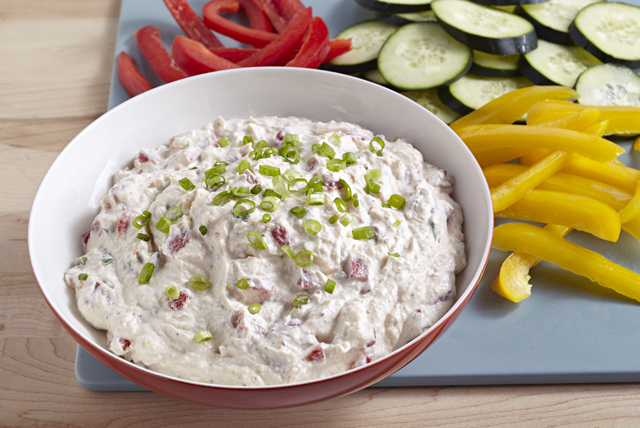 Ten minutes is all you need to make this tasty Roasted Red Pepper and Green Onion Dip. The rest is all chill time in the fridge. Mix mayo, sour cream, cheese and dressing mix until blended. Add peppers and 2 Tbsp. onions; mix well. Serve dip in a hollowed-out bread loaf. Simply cut thin slice off top of 1-lb. round bread loaf. Remove center of loaf, leaving 1-inch-thick shell. Tear removed bread into bite-size pieces to serve with the dip or reserve for another use. Fill bread shell with dip just before serving. Substitute 1 tomato, seeded and chopped, for the peppers.